Toda y, we reached Jerusalem. We began the morning early with the Haram Al-Sharif (or Temple Mount). It is the place where according to scripture Abraham was willing to sacrifice Isaac. It has become the center of so much beauty and inspiration … and so much controversy, conflict, and sacrifice ongoing today. 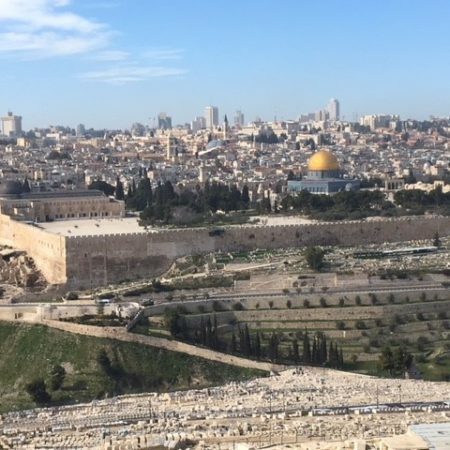 For Muslims, it houses the second and third most holy sites of their faith—the Dome of the Rock (Golden Dome) and the Al Aqsa Mosque (darker dome to the far left by the edge of the wall). 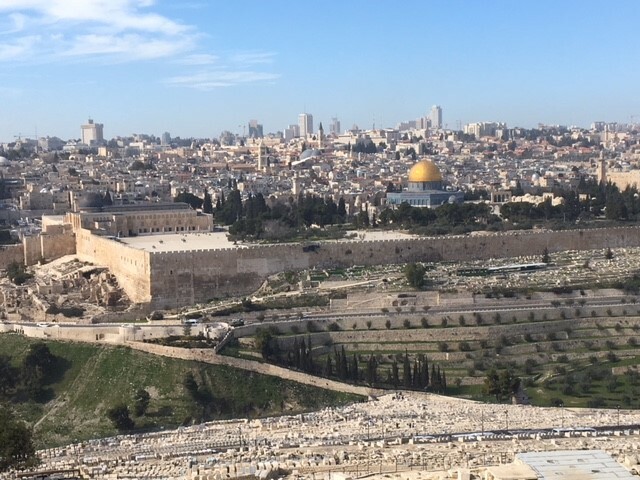 For Jews, just on the other side lies the Western Wall— huge stone blocks that are the only vestige remaining of the foundation for the last Temple in Jesus’ time. 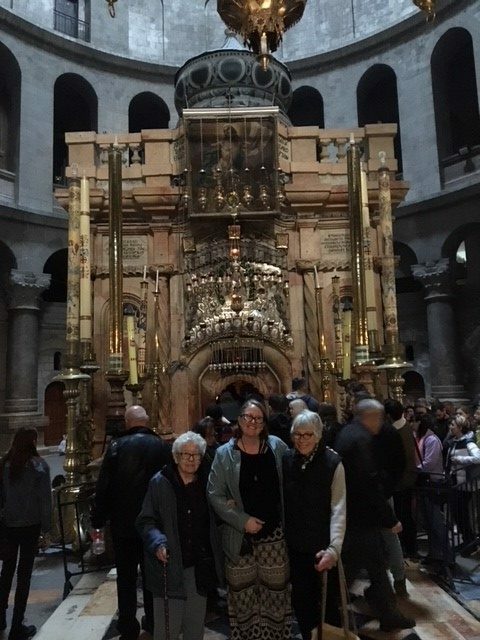 And of course, very nearby is the Tomb of the Holy Sepulchre over the site where it is believed Jesus was crucified and buried. So a convergence of narratives, fraught with a minority of people’s absolutist truth claims and aggressive possessiveness, crea tes much tension and suspicion. It’s supposed to be a holy place, of course. The Dome of the Rock is magnificently beautiful. And I can feel moved by the longing devotion attached to the places. 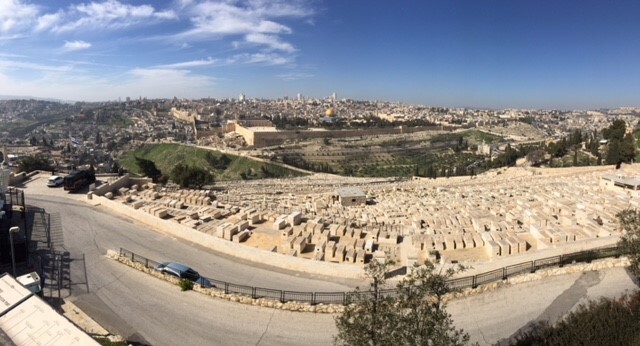 Still, I am more deeply moved by a garden of olive trees on Gethsemane hill that may be something like where Jesus prayed; and by simply walking the old city streets, where people have been at home for thousands of years—walking on some huge flag stones dated to the Roman Era. 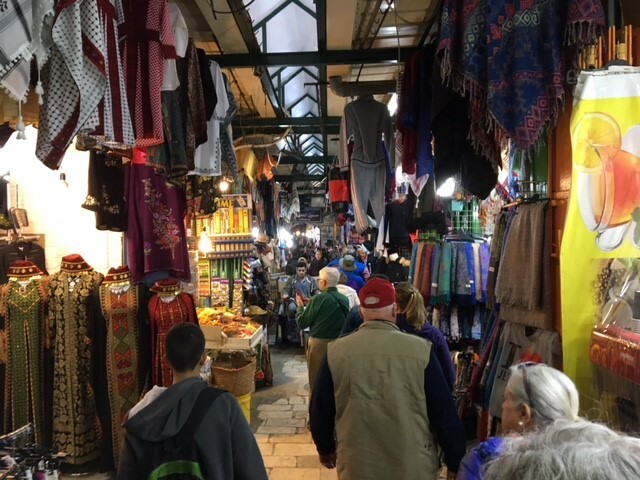 God incarnate, with us everywhere not just in special sites, moves us to live with holy love while we eat and meander an d shop and banter in the spirit of people long ago—like you and me—whose voices and presence seeps from the stones around. As our pilgrimage approaches an end, so may it be for us all amid the stones and streets and routines of ordinary life in the place we call home.